Review: Fright Night – Geek Girls Rule!!! 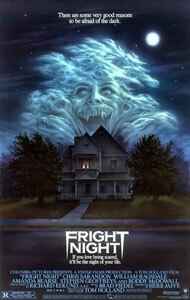 Fright Night is a remake of a 1985 film of the same name, and can be summed up thusly: solid cast, lifeless remake. After teenager Charley Brewster (Anton Yelchin) discovers his new neighbor Jerry Dandridge (Colin Farrell) is a vampire, he recruits stage magician Peter Vincent (David Tennant) to help him put a stake in the bloodsucker. One can describe the direction by Craig Gillespie (Mr. Woodcock, Lars and the Real Girl) as competent and strictly by the numbers. We’ve just seen these setups too many times, meaning scenes that should be suspenseful aren’t. As a former commercials director, he brings a slick visual style to the production, but that just serves to emphasize its weaknesses. The original film had an energetic B-movie sense of fun that’s sorely missing here. Perhaps Gillespie simply takes the material more seriously than is necessary. The screenplay by former Buffy the Vampire Slayer showrunner Marti Noxon is a letdown. The story from Tom Holland’s 1985 screenplay is largely intact, albeit updated, but a lot of the fun has been, well, sucked out of it, while the characters suffer from being hardly fleshed out. So much of the setup is compressed into the first 10-15 minutes that those minutes feel incoherent and rushed. There are a couple of nice additions to this version (like what’s hiding behind a closet in Jerry’s bedroom) and some occasional laughs to be had, but mostly it’s a case of been there, seen that. Half the fun in the original was seeing Charley try to convince skeptical people that his neighbor really was a vampire, while the vampire and his minion gleefully set out to make people think Charley was crazy. Little of those cat and mouse games here, and consequently little of the fun of the original. Instead of a vampire who uses cunning, we have a vampire who indulges in explosions and car chases. Because, you know, there aren’t enough movies with explosions and car chases these days. The main cast fares better. Anton Yelchin has a knack for playing a young Everyman, which serves him well here even with an underwritten character. Colin Farrell has the looks and animal magnetism ideal for playing a superficially charming man who is literally a bloodthirsty killer, and he seems to be having fun with the role. David Tennant livens things up every time he appears on screen as a drunken, womanizing, even cowardly stage magician (a far cry from his Doctor Who role!). I would have loved to see what they could have done with a stronger screenplay to work from. The cast also includes Imogen Poots as Charley’s girlfriend Amy, Toni Collette as Charley’s mother, Sandra Vergara as Peter’s girlfriend/stage assistant, and Christopher Mintz-Plasse as Charley’s friend Evil Ed (a popular character in the original who seems like a throwaway here), along with cameos by Chris Sarandon (who played Jerry the vampire in the original) and singer-songwriter Lisa Loeb. 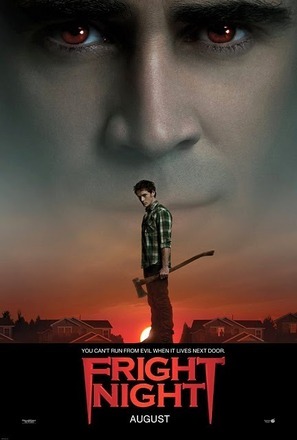 Fright Night is yet another disappointing and pointless remake. It’s competently made, but lacks the cheesy fun of the original. Best saved for a video rental. I’m generally hearing that the best thing about this movie is Colin Farrell’s performance as the vampire and David Tennant’s performance as Peter Vincent. Sometimes views of Tennant’s performance are mixed (and I’m wondering whether it helps to have seen him in Doctor Who first), but Colin Farrell seems to be universally praised for his role in this. It’s sad to see that “Fright Night” ended up a disappointment. I loved the original. It sounds like this is a similar case to “Let Me In” where the reconstruction looks right on a superficial level, but lacks the soul of the original. Previous Post Geek Girls Rule! #183 – Get Over It.